VATICAN CITY (CNS): The Catholic Church’s oldest cardinal, Ignatius Kung Pin-mei, died on March 12, aged 98. 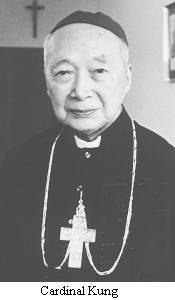 Cardinal Kung, considered by the Vatican to be the legitimate Bishop of Shanghai until his death, had spent more than 30 years in prison in China for his refusal to renounce his ties with the Vatican and with the Pope. The 98 year-old was diagnosed with stomach cancer in late February and died in Stamford, Connecticut. His death leaves the College of Cardinals with 152 members, 104 of whom are under age 80 and therefore eligible to vote in a papal conclave.